Jim Holbery joined the Applied Sciences Group in 2014. Jim has been responsible for developing the Printed, Textile and Flexible Electronic (PTFE) Lab and has contributed capabilities in battery development, composite lightweight materials and displays. Currently his focus is on creating new user experiences through soft electronics. 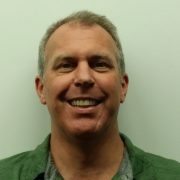 Prior to Microsoft, Jim was the founder of two start-up companies; GridMobility was a early IoT entry in the energy space, the winner of the 2011 Global CleanTech Open and featured in Time magazine; Ti Horizons was a Titanium mountain bike company founded in 1992 that achieved a successful exit. Previously, Jim served 5 years as Staff Scientist within the Energy and Environment Directorate at the Pacific Northwest National Laboratory directing energy research at the national scale. Prior to that Jim spent 3 years as a Sr. Scientist at the Swiss Center for Electronics and Microdevices in Neuchatel, Switzerland developing micro-electronic devices, IC fab processes and novel thin films, was a visiting scientist at the CSIRO Applied Physics Group in Sydney, Australia, spent two years designing skis and snowboards for K2 Sports, and spent four years at Ford Aerospace, then a division of Ford Motor Company where he was a Group Leader in Spacecraft Engineering. Jim holds a BS Mechanical Engineering, MS and PhD in Material Science from the University of Washington where his focus was polymer processing, colloidal science, composite materials and mechanics of materials. Jim is dedicated to his two children who are the light of his world. Additionally he has a keen interest in building things – composite structures, pottery, wood working, sculpting, casting. He is very interested in the outdoors and hopes to one day convert the two stories he is writing into something more than just wasted space on his hard drive.